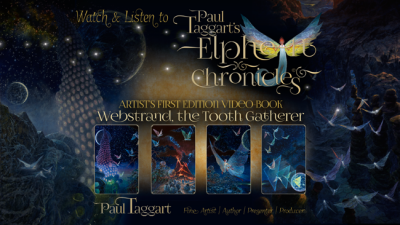 "Welcome to ‘Watch & Listen to Paul Taggart’s Elphen Chronicles’ – you join me for ‘Webstrand, the Tooth Gatherer’. Next time you look up into the royal blue of an evening sky and spy a falling star, think of the Elphen. Somewhere, not so far away, they are gathering their numbers to follow that star until it reaches Earth; where, hidden in the undergrowth they will find their treasure - an Elphen Egg that has tra versed the Starfields to reach its destination. You may well see them on their journey home, carrying their egg between them. Tiny specks against the night sky; only visible when they cross a bright star, or the face of a full moon. Let me share with you the chronicle of an Earthling, who goes by the nickname Fizz; whose creative imagination and zest for life, leads her on a remarkable journey. 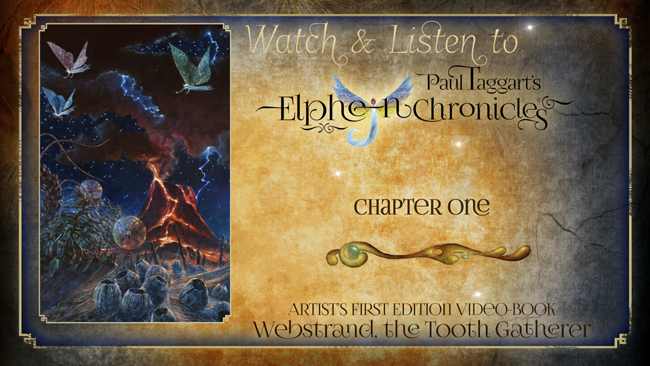 A journey that was to change her life forever, on which, her guide is none other than, Webstrand, the Tooth Gatherer. If, like Fizz, you also come to believe in Elphen and search carefully along a star’s path, you may find what appears to be a small glowing ember in the undergrowth; but be on your guard, for once you start the search, it can soon become a quest. WA TCH as I depict the story of 'Webstrand, the Tooth Gatherer', through my scene-setting original Masterworks oil paintings and … LISTEN as this chronicle of a wondrous journey is told – a journey that begins in Fizz’s creative imaginings. 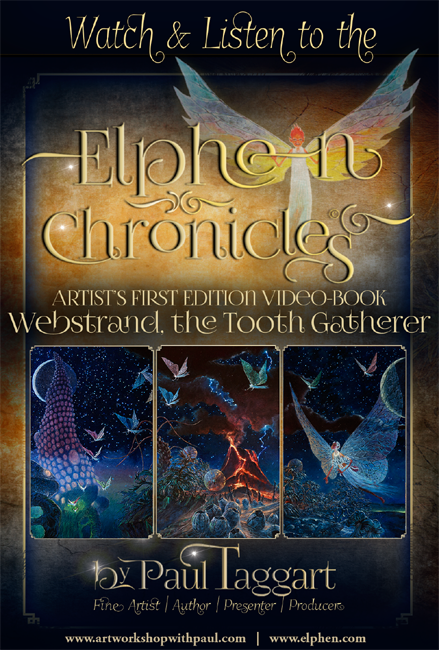 LISTEN as I read through each of the nine chapters in which Fizz is taken by her new-found Elphen friends on a sometimes exciting, sometimes terrifying, voyage of discovery. WATCH as I share with you, the magic of a painting coming to life, through unique reveals of the Webstrand Masterworks, as they unfold from the very first paint strokes to the final highlights and … LISTEN to the original Musical Soundtrack and Soundscape that undulates through the good times and bad, the joy and horrors, the magical and real, the very essence of this chronicle of ‘Webstrand, the Tooth Gatherer’.